Being the Bishop of the Ukrainian Lutheran Church means you can see two different Presidents of Ukraine in three days in a row. This is what has actually happened to me this week. 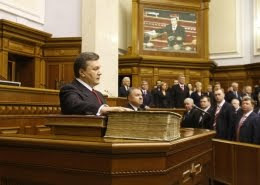 On Tuesday, February 23, 2010, I was invited to join All-Ukrainian Church Council to express birthday greetings to President Yuschenko at his Office. My gift to the President was the book of sermons "We Preach Christ Crucified" published by the Lutheran Heritage Foundation in the Ukrainian language. President Yuschenko thanked me that I stood all his term along with him faithfully and we had some wine together. On Thursday, February 25, 2010, I was invited by the new President of Ukraine, Victor Yanukovych to visit his Festive Reception at the Ukrainian House, downtown Kyiv. There were many guests there and I was one of them. I personally was able to approach President Yanukovych and greet him on behalf of the Ukrainian Lutheran Church as well as wish the richest blessings of the Lord in his presidency and promise prayers of our Church for him as the President of our country and Ukraine. The new President expressed his hearty thanks to our church body and me. 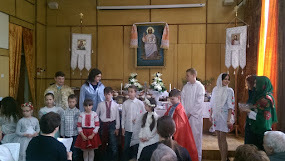 Such invitations and visits show respect Ukrainian authorities have to the Ukrainian Lutheran Church and also give us a possibility to promote freedom of confession in our country. 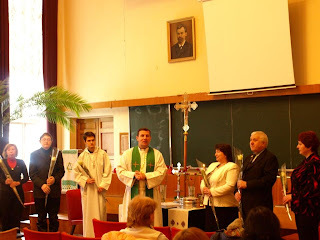 On February 14, 2010, three new deacons and three new deaconesses were commissioned in the Resurrection Lutheran Church in Kyiv. Their names are: Anatoliy Dmytrenko, Serhiy Berezin, Dmytro Propkopchuk, Hanna Kuchma, Anzhela Horpynchuk and Emilia Zinchenko. They will "wait on tables" (Acts 6). The Resurrection Lutheran Church has prayerfully asked the Lord to grant those brothers and sisters many happy and blessed years as they serve their neighbors and share the Gospel.